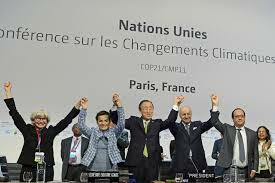 I for one find it encouraging news that Donald Trump has pulled the United States out of the Paris Accord, whose official term is the Paris Agreement, which falls under the United Nations Convention on Climate Change, adopted by ‘consensus’ on December 12, 2015. Of course, such consensus is bestowed by the enlightened leaders, and need not entail such consensus amongst the vast swath of the ‘unenlightened’ people, which is a big part of the reason Donald Trump was elected. The Accord/Agreement has set targets, which countries are ‘free’ to achieve by their own means, but there is coercion, via what has been called a ‘name and shame’ system or, as one euphemism has it, ‘name and encourage’. They want to reduce the Earth’s temperature by 2 degrees within a decade or so, by severely reducing greenhouse gas emissions, namely, carbon dioxide. As I and others have written before, there is no strict correlation that can be derived between reduction in carbon usage and the temperature of the Earth, which flucuates based on factors well outside our control, not least the Sun. There is therefore never really an answer to how much is enough (they speak in terms of ‘gigatonnes’ of carbon and such, beyond anyone’s imaginary powers,to say nothing of control), for the underlying premise is that any burning of carbon is ‘bad’ for the environment, which basically means that life, specifically human industrial technological life, is bad. Is this a philosophy we want to encourage? Donald Trump realizes that Western nations, which more or less means the United States, will carry most of the severe economic burden of this reduction, while other nations benefit enormously, a scheme to redistribute wealth by world-governmental fiat, based on dubious science, about which there may be some sort of consensus, but not a lot of hard-boiled facts. I was concerned, but not surprised, to read of various ‘Vatican officials’ also experessing their consternation, which some of them see as a ‘slap in the face’, especially after the recent cordial meeting between Trump and the Pope, with a signed copy of Laudato Si to commemorate the occasion. Did not Trump promise to read it? And listen to the Pope? Yet Trump is not obliged to act according to the wishes of the Vatican. Even Catholics are only so obliged insofar as the Holy Father exercises his hierarchical and magisterial authority within its proper limits. The Pope is competent to teach on ecology, a subset of moral theology, but the specifics of how this may be carried out is up to our own conscience, unless some sort of intrinsic evil is involved (difficult to envisage when one speaks of the environment). Furthermore, the Church should not link its moral teachings to scientific hypotheses, something that Father Le Maitre, who formulated the theory of the Big Bang early in the 20th century, warned Pius XII, who wanted to use the theory to bolster the doctrine of creation ex nihilo. Father Le Maitre cautioned the Pope that his theory, for all of its evidential support, may not be true; indeed, no inductive evidence would make it absolutely true, unlike the a priori doctrine of creation, itself which is true always and for all time, regardless of how it came about ‘scientificially’, in the realm of time and space. So too, ecology as a moral principle is fine and sound, but it is not so sound to link such a proper care for the environment and our resources to the dubious theory of carbon-induced climate change. Not just that the hypothesis may be proven false (something I doubt scientists would ever allow, hence climate change versus global warming), but also that the hypothesis leads to irrational, if not outright evil, policies, everything from economic stagnation to population control. I am glad to see the consensus on the never-ending hype of global warming just got a bit smaller, well, a whole lot smaller, for the U.S. is the biggest player in this game, and when its chips are pulled out, there isn’t much left. Hence, the global backlash filling the news pages, vilifying Trump. But stand firm, Mr. Trump, for we need many more such skeptics. This entry was posted in Economy, Politics, science and technology. Bookmark the permalink.